In the beautiful, barren landscape of the Far North, under the ever-present midnight sun, Frances and Yasha are surprised to find refuge in each other. Their lives have been upended--Frances has fled heartbreak and claustrophobic Manhattan for an isolated artist colony; Yasha, a Russian immigrant raised in a bakery in Brighton Beach, arrives from Brooklyn to fulfill his beloved father's last wish: to be buried "at the top of the world." They have come to learn how to be alone. In Dinerstein's captivating debut novel, an isolated island above the Arctic Circle is the setting for two people trying to surmount grief and find love. After being jilted by her boyfriend, 21-year-old Frances flees Manhattan to apprentice with a laconic Norwegian artist in a remote community called Lofoten, where she learns to adjust to the unending daylight of a Scandinavian summer. Meanwhile, Yasha Gregoriov, five years Frances's junior, comes there to bury his father, Vassily, a Russian immigrant to the U.S. whose wish was to be interred in a peaceful place "at the top of the world." Both Frances and Yasha are products of dysfunctional families. Frances's parents bicker continually and use their high-minded principles to try to destroy the engagement of Sarah, Frances's sister. Yasha's mother, gorgeous Olyana, abandoned Yasha and Vassily, the kindly proprietor of a Brooklyn bakery, a decade earlier. Dinerstein (author of Lofoten, a bilingual English-Norwegian poetry collection) writes of these domestic situations with humor and compassion. Her prose is lyrical and silky, but it's also specific, with acute observations and precise detail, and she evokes the sun-stroked, barren Norwegian landscape with a striking sense of place. Her descriptions of Yasha's grief and of the tentative love affair between Frances and Yasha are palpable with loss and yearning. 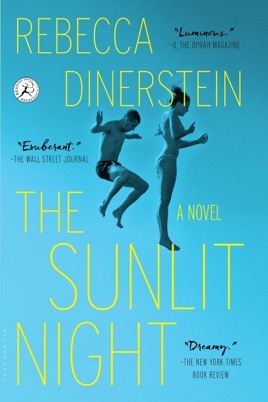 With provocative insights about the cruelty of abandonment, the concept of home, and the limits of parental and filial love, Dinerstein's novel is a rich reading experience. Beautifully written novel. Very poetic. Simple yet complex themes. Thought provoking, heartbreaking at times, and ironically comic. Enjoyed reading this book, highly recommend it!